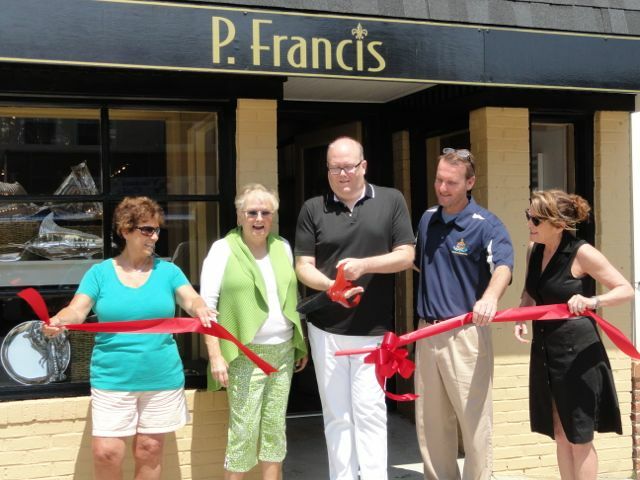 Joanne Clarke, Lauralee Williford and Paul Cunningham cut the ribbon opening P. Francis, along with Ocean City Mayor Jay Gillian and Ocean City Regional Chamber of Commerce Executive Director Michele Gillian. Two downtown businesses celebrated moves to new locations within Ocean City with ceremonial ribbon-cuttings on Wednesday. P. Francis moves from the 700 block of Asbury Avenue to a newly remodeled and intimate space near the prime intersection of Ninth Street and Asbury Avenue. The gift shop continues with all the exclusive brands and product lines that its customers have come to know and love — including Mariposa, hand-crafted serveware made out of recycled sand-casted aluminum. The shop includes tabletop, bath and body products, home fragrances and candles. 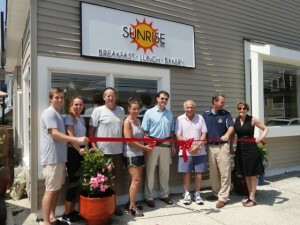 R.J. Idell, Jill Noon, Bob Idell, Sharon Idell, Councilman Mike DeVlieger, landlord Marvin Goldstein, Mayor Jay Gillian and Ocean City Regional Chamber of Commerce Executive Director Michele Gillian mark the opening of Sunrise Cafe. The popular breakfast and lunch spot moved in May into a property formerly occupied by F&M Restaurant at the corner of 12th Street and Asbury Avenue. The cafe first opened in May 2013 at 949 Asbury Avenue with a menu featuring low-priced breakfast and lunch and fresh-baked goods. The new location features more outdoor seating and an expanded takeout area for Sunrise specialties, including coffee, popovers, scones and deli sandwiches. The cafe is offering a $1 deal on all takeout coffee through Labor Day (use the 12th Street entrance for takeout). The cafe is open seven days a week from 7 a.m. to 3 p.m.